Why Do We Live and What Is the Purpose of Our Development? What Direction Do We Advance in? Life puts a person in a framework he did not choose. We don’t know what destiny is prepared for us, who we shall meet today, what will happen to us on our way to work or back home, what to expect for our children and relatives. Who are we compared to the universe with its endless stars and planets? Tiny bugs crawling on the surface of the Earth, whose whole lives are devoted to the struggle for survival. And yet, we ask what the purpose of our lives is and are concerned about the purpose of our existence, the possibility of determining our future, managing the destiny of our families, people, countries, and the entire world. Everything depends on our ability to question ourselves about the ultimate goal of our development. We depend on the level from which we ask this questions and the accuracy of our search for the answer to it. There is a general developmental program that works in the world. If we look closer at our lives, we’ll see that it is not us who make decisions; we are inside a matrix program. This program works on us constantly, inputting new parameters in our existence and places us in different external and internal conditions. Our cognition is made up of our inner experiences in our minds and hearts, bodily sensations, and things we perceive around us. As a result, we constantly advance and process internal and external data in accordance with programs that we don’t know about. The program is installed in us at the time of birth; it continues with our upbringing. We are not the ones who define it. In other words, we don’t have any decision making power in life. We see that a guy and a girl meet “accidentally,” then marry and live many years together. Why does it happen? We are incapable of answering even this one simple question. When we strive to understand our life path, the general program of nature that moves us ahead to a special goal, if we learn what goal we aspire to, we need the wisdom of Kabbalah. Of all earthly sciences, there is only one that tells us about human development that is beyond the material limitations and above our universe. The wisdom of Kabbalah talks about the governing and controlling vectors that begin outside our Universe and impact our tiny globe and the people who live on this planet. 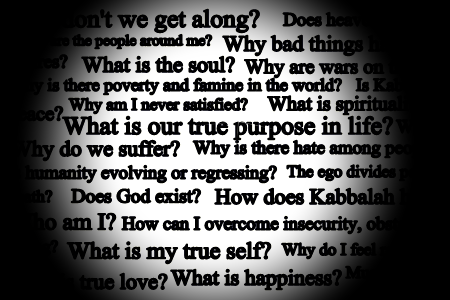 The wisdom of Kabbalah talks about a special purpose of human beings that we have to pursue. Our advancement is unconscious; it happens under the influence of a power that forces us to progress. However, as a result of the evolution, humanity will reach a state when people have to choose whether they want to continue their advancement consciously, willfully, and knowingly or not. Unity increases our desire, thus empowering us to reach the goal that is set for us by nature.